How to Tune a Guitar - Guitar For Beginners Lesson. Learn how to Tune a Guitar for Free! Here's an free lesson to show you how to tune a guitar. This will be in standard tuning (E A D G B E). For alternate tunings check out the Guitar Tuner page. 1. 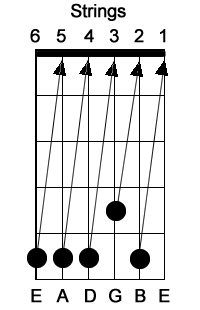 Pick the 6th string and tune it to an E. You can use a piano, an electric tuner, pitch pipe, another guitar that you know is in tune or you can use the audio below Figure 1. 2. On the 6th string press down on the 5th fret and pick the string. This is A. Now tune the 5th string to this pitch. See Figure 2. 3. On the 5th string press down on the 5th fret and pick the string. This is D. Now tune the 4th string to this pitch. See Figure 3. 4. On the 4th string press down on the 5th fret and pick the string. This is G. Now tune the 3th string to this pitch. See Figure 4. 5. On the 3rd string press down on the 4th fret and pick the string. This is B. Now tune the 2th string to this pitch. See Figure 5. 6. On the 2nd string press down on the 5th fret and pick the string. This is E. Now tune the 1st string to this pitch. See Figure 6.